What It’s About: The South Seas Queen, a legendary Indonesian figure, kills her husbands mid-coitus. Her 100th husband, however, is wily and defeats her, but not before she proclaims that she will get her revenge Katia Vajda-style, i.e. a hundred years later, on the husband’s granddaughter. 100 years later, a nosy Western anthropologist grad student ( watch out!) searches for the South Seas Queen, and, in her undersea lair, is possessed by the South Seas Queen. She swims ashore and immediately begins a rampage that ever so slightly (that should read completely) rips off The Terminator, starting with murdering two men for their clothes. The possessed grad student sets off to murder the pop star granddaughter of the 100th husband (our Linda Hamilton substitute). Can a dedicated cop and Jakarta’s enormous supply of machine gun-toting, motorcycle helmeted cops stop the Lady Terminator? Why Watch it Today? : The original Terminator was released on this date in 1984. 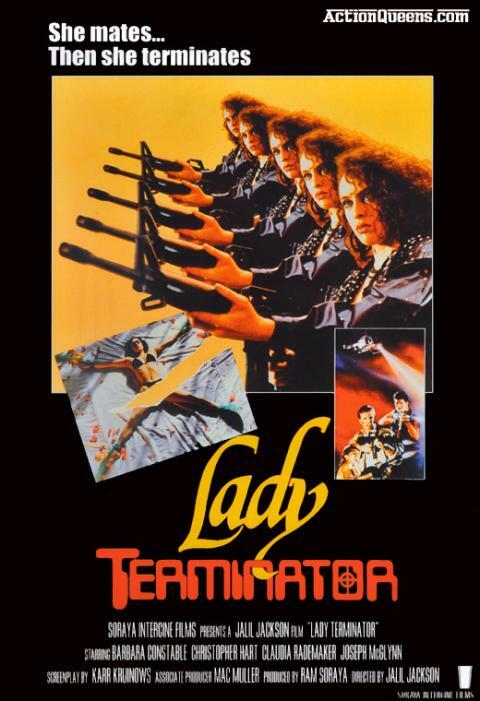 Lady Terminator steals many scenes from the earlier hit in its attempt to make a film in Indonesia that could be marketed abroad (a law at the time specified that theaters had to show a certain percentage of locally produced content, leading in a brief boom in over-the-top B action films as producers attempted to cash in on the situation). The unique blend of over-the-top action, shameless theft and local folklore make Lady Terminator an unforgettable “WTF” experience even if it is more action heavy that it’s inspiration. Other Choices: You might also watch another wonderfully terrible Terminator knock-off, R.O.T.O.R. ; sequel Terminator 2 ; or Terminator inspirations Westworld and Colossus: The Forbin Project. This entry was posted in Action, Event Film, Fantasy, From Beyond the Grave, Horror, Independent, Movie of the Day, Revenge, So-Bad-It's-Good, Witches and tagged cash-in, cops, flashback, helicopter, Indonesia, low-budget, maverick cops, mystics, opening kill, rip-off, rocket launcher, singer, underwater photography, unstoppable killer.